Java I/O, NIO, and NIO.2 is a power-packed book that accelerates your mastery of Java's various I/O APIs. In this book, you'll learn about classic I/O APIs (File, RandomAccessFile, the stream classes and related types, and the reader/writer classes). Next, you'll learn about NIO's buffer, channel, selector, regular expression, charset, and formatter APIs. Finally, you'll discover NIO.2's offerings in terms of an improved file system interface, asynchronous I/O, and the completion of socket channel functionality. After reading and using thi book, you'll gain the accelerated knowledge and skill level to really build applications with efficient data access, especially for today's cloud computing streaming data needs. 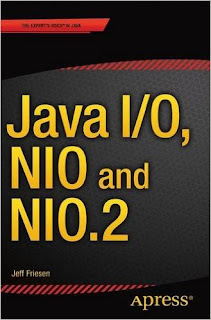 This book is for those experienced with Java, beyond the fundamentals.